Cleaning your skin is very important as it is the skin that protects the body from all external agents. Want to treat your skin the natural way, without letting it come in contact with any chemicals present in the face washes and cleansing foams that you get in the market? If so, here is the way you can do it. Take half a cup of sour curd and mint leaves and blend them well so that you get a smooth paste. Now take 2 or 3 aspirin tablets, powder it, and then add this to the paste. Use this as a scrub on your hands and face and massage well. After massaging for a while, you can rinse with water. This acts as an excellent cleanser and cleans your skin. By adding aspirin you are adding salicylic acid to the mixture. This works well for sensitive skin. If you have extra paste, you can store it in the refrigerator, but make sure that you use it within two days. It is said that the beauty secret of Cleopatra is milk. She used to take bath in milk. Milk is an excellent cleanser and is a rich source of AHAs, which means Alpha Hydroxy Acids. Take chilled milk or milk at room temperature in a bowl and dip cotton balls in it. Clean you face well with this cotton ball. This helps in cleansing your face and also keeps your face well moisturized and glowing. It is an excellent treatment for dry skin as well as combination skin. Mix 2 teaspoons of baking soda with 1 teaspoon of fresh lime juice. Now wash your face with plain water. This is ideal for people with oily skin. Make a powder of sesame seeds and then add honey to it. Mix them well and apply this mixture on your face. Leave for a few minutes and then wash off with water. This is excellent for those who have dry skin. Take gram flour in a small bowl and add turmeric to it. Now add vinegar or rose water and then mix all of them well, so that you get a fine paste. Apply this paste on your face and wait for about 15 minute. Wash off with water. This is perfect for all types of skin and is an age old method for cleansing your face. This will give you a smooth and glowing skin. Another natural way to cleanse your face is to mix whole wheat powder or atta, and vinegar. Apply this paste on your face. Cleanse your face with this paste and wash off with water. This is an excellent cleanser and makes your skin smooth, soft and radiant. This is also a method that had been in practice for ages and is good for all types of skin. Corn meal is also an excellent cleanser and cleans your face well. Take about 4 tablespoons of corn meal and half a cup of yogurt. Mix them well in a bowl and apply on your face. Cleanse your face with it and then rinse with plain water. This is particularly good for those who have dry skin. Take some oatmeal flour and mix rose water or vinegar with it, so that you get a paste. Apply this on your face and massage well. Rinse off with water. This cleanses your face and provides you smooth and glowing skin. If you have an oily skin, you can cleanse it with lime juice and egg. Take about 1 teaspoon of lime juice and add one teaspoon of honey and the white of an egg to it. Mix them well and cleanse your face with this mixture. This will keep your skin radiant and soft. Almonds and peanuts are also good for cleansing your face. Take two teaspoons of almonds or peanuts. You can roast it dry without adding anything to it and then grind it to get a powder. Mix one teaspoon of lime juice and honey to this and then use it as a cleanser. Wash off with plain water. This cleans your face and also helps in eliminating dark spots from your skin. This mixture is especially good for women having sensitive skin. Fruit acid peels make good cleansers, but sometimes after you apply this on your face, your face your skin may suffer from rashes and redness, and even scars. So it is better to use natural acids on your face instead of using acid peels. This will not harm your skin in any way and leaves your skin smooth, soft and rejuvenated. Here is how you can do fruit acid cleansing. Take and orange, lime or lemon and take its juice. Use it fresh. Dip a cotton ball in the fresh juice and dab your face with it. 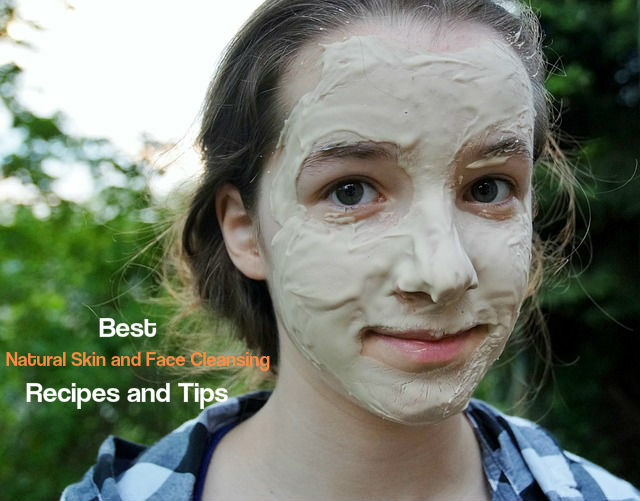 This will thoroughly cleanse your face and you will get a clear and smooth skin. You can also use apple cider vinegar instead of the juice of lime or orange to clean your face. Dip a cotton ball in apple cider vinegar and dab your skin. One other way to cleanse your face is to take lukewarm water and rose water in equal quantities and dabbing your face with a cotton ball dipped in it. You can even use plain rose water for cleansing your face. This will clean your face and also tones your skin well. Rose water is used as a good toner and is applied before you apply makeup on your face. Now that you know how to cleanse your face naturally, follow some of the tips given above and see how clean and rejuvenated your skin becomes. These natural products have no side effects and contain no chemicals. So they do not harm your skin in any way.